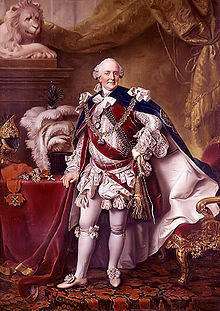 On July 25, 1792, the Prussian, Charles William Ferdinand, Duke of Brunswick, issued an ill-timed and uninspired warning to Revolutionary France. Known as ‘Brunswick Manifesto’, it threatened the Parisians with reprisals if the French King was harmed. Unfortunately for spunky ol’ Charlie Brunswick, the French of the 18th century had not yet fully acquired the fear of the Germans. The manifesto only served to inflame the already volatile tempers of the French, who for the next 20 years opened the proverbial can of (nationalistic) derriere-whooping. They layered it evenly over the whole continent. But before all that – they promptly guillotined their king. Just to annoy Brunswick. When Napoleon visited Prussia in 1806 (together with his 100,000 friends from La Grande Armee), the unlucky Duke got something in his eye: a musket ball. Severely wounded, Brunswick died not long after. He probably had enough time to deeply regret his fatal signature on that manifesto. 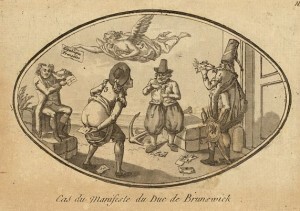 Library of Congress description: “Print shows four figures representing foreign nations responding unfavorably to the manifesto issued by the Duke of Brunswick and Lüneburg on July 25 179 . It is reproduced below for your viewing with this History File post on MilSuccessNet long after the web page carousel has spun onto newer posts.